Support the UCSC Farm & Garden Apprenticeship training program's work by enjoying a meal at some favorite local restaurants as part of the Dining for Farmers dinner series, taking place August through October, 2017. The series helps celebrate the UCSC Farm & Garden's 50th Anniversary, and menus will feature produce from the UCSC Farm & Garden as part of the restaurant's regular meal service. Invite your friends to join you! 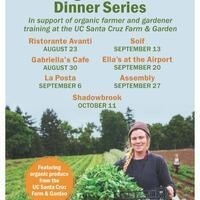 On Wednesday, August 23, Ristorante Avanti will donate a portion of the evening's proceeds to support organic farmer and gardener training at UC Santa Cruz. This benefit event is a regular part of the restaurant's meal service; no special admission is required beyond the regular meal cost.